5th graders and siblings, come join us throughout the year as we explore our American Heritage together!! These activity days will be integrated across the curriculum and will follow the 5th grade social studies timeline. You must register separately for each Activity Day. Our HCS newsletter will announce when registration opens for each event. The registration link can be found under our Parent Resources tab>Registration Links. Priority will be given to the current 5th grade class and the upperclassmen who have not attended in the past. Applications need to be turned into the office by August 31 by 4:00 p.m. A lottery drawing and a wait list will be in place if needed. This fun and exciting program is held on Angel Island at Camp Reynolds, a Union Civil War outpost. When the "new recruits" arrive on the island they will become Union Army soldiers from the year 1864. They will hike to Camp Reynolds carrying their personal gear and will be assigned bunks in the Quartermaster building. During the day, recruits will participate in training activities including militia drill, flag signaling, mess cooking, bread baking and compass orienteering. In the evening the recruits take a night hike up Mr. Livermore. One of the favorite activities of the students is night watch in which each squad takes a turn keeping an eye on the camp to secure their location. In the morning, one squad is chosen to assist in the cannon firing demonstration. Click here for application - Application must be filled out by the student and the parent. Please print and deliver (with deposit) to the office by August 31 at 4:00 p.m.
Activities include: Compass navigation; designing a compass rose and a short presentation of an American historical biography project. Plan early so students will have enough time to choose and research a famous influential American of their choice. There will be separate activities for K-2 students. We conclude our day with an Explorer's Picnic which features food that an early Explorer would eat out on the open sea. Come celebrate the colonial way! 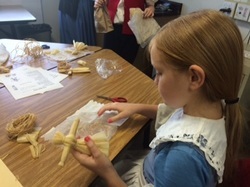 Activities include rope making, stenciling, molding beeswax candles, making corn husk doll, and experiencing colonial games. We will also enjoy a wonderful potluck lunch. Please note that this event is centered around a Christmas theme. The entire family is welcome to join us! Program: 1:00 - 3:30 p.m. Participants are in teams and will be performing skits. What: This history activity day will alternate every other year with the Oregon Trail. Students will be divided into two teams: the Union Pacific Railroad and the Central Pacific Railroad. While learning about the facts behind the Railroad, students will compete by completing various physical and mental activities to see which team will lay the most track. There will be separate activities at the same time for siblings in Kindergarten through 3rd grade. The entire family is encouraged to navigate the 2000 mile Oregon Trail (the entire Hickman campus) in your own wagon party. Students will take their "covered wagon" across the Blue Mountains; navigate the "waters" of the Columbia River; trade with helpful Native Americans and encounter many other places and situations along the trail. 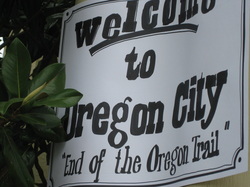 Students will celebrate their journey of a lifetime in Oregon City (the auditorium) at an ol' fashion square dance.